Brain food: If a recipe calls for a 'bunch of herbs' exactly how much is a bunch? Out in Sevres, near Paris, sitting under a glass dome at the International Bureau of Weights and Measures, is a block of platinum and iridium weighing exactly one kilogram and against this all metric weights are calibrated. There is, however, no platinum bunch of parsley. We went out and assessed parsley at the weekend and can confirm that the average bunch of parsley contains 12 stems, weighs 55 grams and contains just over two cups of sprigs. 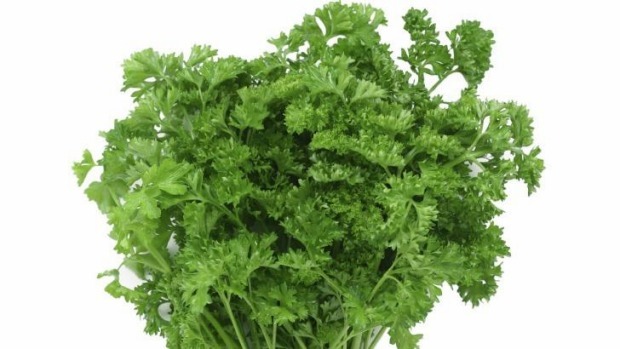 Interestingly, supermarket parsley sold in a plastic sleeve weighed 56 grams while the parsley sold in a plastic box for the same price contained just 29 grams of parsley. The parsley in the plastic box did have shorter stalks but when we cut the stems off the parsley sold in a sleeve it still weighed 45 grams. So buy parsley in the sleeve and use the stalks in stock. Even better, grow your own. At a recent ladies' luncheon the guest next to me insisted on photographing her meals despite our host twice asking her to desist. What is the most effective way of dealing with such an offender? Gina D.
Oh dear. In our lives we are seeing much change and progress. This is neither. This is just ignorance. While some consider it gauche, it is now acceptable to photograph and Instagram restaurant meals. I recently dined with a friend at a well-known restaurant and received an email several hours later from its publicist asking me when they should expect my images and comment on social media. To take a photo of a dish at a private home, however, is a very different matter. Your host asked the other guest not to. The offender continued. She should have just put her bare feet on the table and lit up a Winfield Blue. It would have been more polite. There is the concept of "cellphone-free dining" in the US where, to improve the atmosphere and conviviality, diners in restaurants are offered discounts if they leave their mobile devices with the cloakroom. It is acceptable, and I have seen it done in people's homes, where the host asks everyone to either turn off their phones, leave them on the fridge or desist from using them. Life's too short to watch and wait for someone else to text, tweet or blog. I loved the way that Kel Knight, the butcher on Kath and Kim, was always experimenting with sausage flavours even recording sausage flavour brainwaves on his Dictaphone. A lot of good butchers use real dried herbs and spices to make novel flavours. Some butchers, however, use premix. This is a mix of starch, salt and flavourings. One popular premix contains rice flour, salt, MSG, mineral salts, dried herbs, sodium metabisulphite​, hydrolysed vegetable protein and sodium aluminosilicate. The rice flour allows the butcher to add an extra two litres of water for every nine kilograms of minced meat. Ask your butcher to see the ingredients list in the premix. I'll let you make up your mind whether you want to eat the stuff or not.